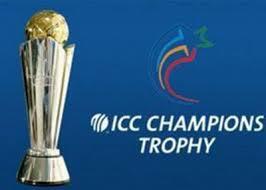 ICC Champions trophy 2013 was begun on Thursday, June 06 2013 in England. The ICC Champions trophy is an International tournament also called as the Mini World Cup. ICC Champions trophy 2013 is organized by the England. ICC champions trophy has around 15 one day matches scheduled in June 2013 and all matches will be in England. The final of the ICC Champions trophy tournament will be played on 23 June 2013 in Edgbaston, Birmingham. The first match of the ICC champions trophy 2013 was played between India and South Africa on June 06, 2013. ICC champions trophy 2013 had total 8 teams divided into the two group's name A and B. Group A had Australia, England, New Zealand and Sri Lanka while Group B had India, Pakistan, South Africa and West Indies. All teams are doing good so at present it is difficult to say who will win the ICC champions trophy 2013. India and South Africa had already reached into the semi final of the ICC champions trophy 2013.